The image above is from the local paper in Jersey, Channel Islands. it is about a local historian who is trying to find out more about the little known subject of soldiers based in Jersey at the end of WW1. This is something I am very interested in too. The trouble with researching family trees is that there can be an awful lot of ‘hearsay’s’ and ‘apparently’s’. This is a post about my great grandfather who ‘apparently’ was an Australian soldier during World War One and at some time was based in Jersey, Channel Islands (which is how he met my great grandmother). This is not a subject that many people seem to know a lot about if anything at all. So I thought it was time to put it out there in the hope that one day a reader will know what I am talking about. Apparently there were not enough boats to send soldiers back to their home countries once the war had ended. So in the meantime a project was set up ‘through the efforts of a Lieutenant benest’, according to the article above, in order to train these men with skills they would be able to take back with them, such as agricultural training. This incentive was not just set up in Jersey but in England too. There was an Australian group of soldiers in the Island at the time. That is all I know for the meantime, but should more information come my way then I shall write more about it. Unless you know more! Previous On this day – Mabel Maud Lozuet was born in 1902. 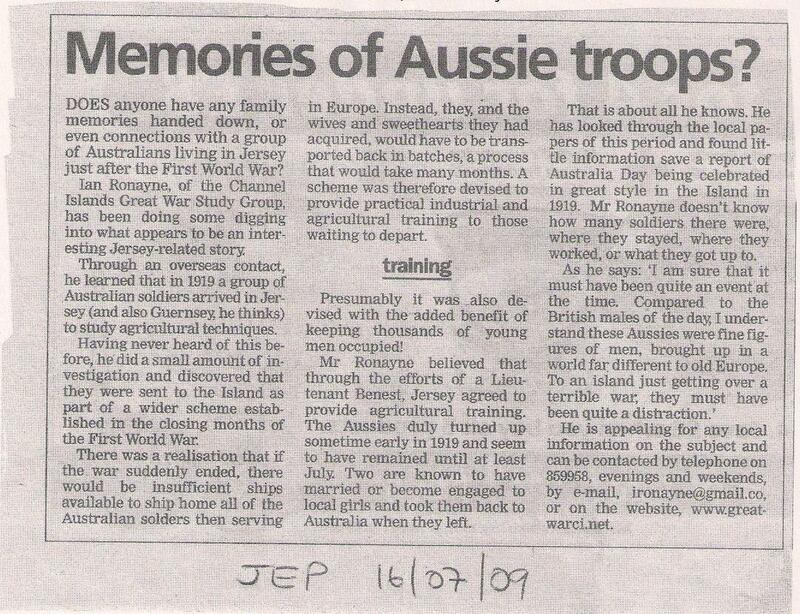 “I was intrigued to read about the Australian Soldiers in Jersey in the early 1900’s. My uncles mother met and married (in Jersey in 1918)Samuel Baker who was in the Australian Navy and also knew a Ronald Chappell also of the Australian navy. Do you know why the Australian Navy were in Jersey and how long they were here for? I have also been unable to trace when they both left Jersey for Australia, but it was before late 1921 as their child was born in Australia. So you see, there are more of us wanting to find out about this past event. If you know more or think you may be connected to Suzanne please contact me as I would love to hear anything extra you may know! I have just noticed your article while researching my grandfather’s WWI diary in which he, as an Australian soldier was given leave to “attend Lieu Benest of St.Hellier, Jersey for agricultural purposes”. My grandfather was Veterinary Sergeant Francis (Frank) Holbrook and he was in Jersey from April to August 1919. His civilian occupation was that of a dairy farmer and has received his veterinary training in Melbourne before heading overseas. It was during his time in Jersey that he met my grandmother Florence Elizabeth Marriette of St.Sampson, Guernsey. (I have a photo of a group of Australians on board a boat arriving in Guernsey from Jersey). Frank returned to England,back out to Australia to be demobilized and then returned to Guernsey where he married my grandmother on the 19/7/1921. They, including his parents in law (John Marriette and his wife Nellie (nee Brice)) came out to Australia in 1922.